A little more internet searching led me to a suggestion to use GIMP's Lighten only mode for combining layers. This is the same image from yesterday, only using Lighten only to combine the layers. I also found this great set of GIMP plugins that someone wrote for processing astronomy type images. It's the 'Set mode for all layers' script that I was most interested in. 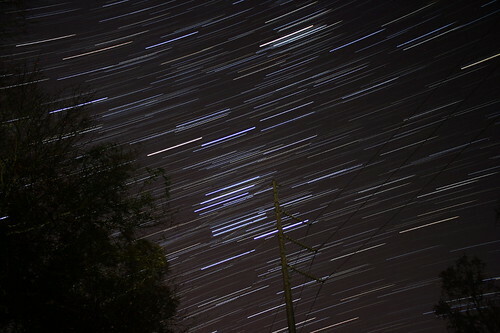 My third attempt at stacked images for star trails (the second attempt was all out of focus). This time I put the camera on burst mode, 30s exposure (the longest exposure my XT will do before bulb mode), f/3.5 and left the remote trigger locked down. This is Orion streaking through the sky, composed of 58 images. The much shorter exposure and wide open aperture gives a much darker sky and brings out a lot more stars. It also means a lot more images to process: 60 images for a 30 minute exposure. Loading all those images requires a computer with lots of RAM. Good thing I bumped the memory in my computer up to 24GB. The computer hardly breaks a sweat when I ask GIMP to load that many images (at 3456x2304, GIMP says each image takes up 71MB). Now I want a wider angle lens for my camera.